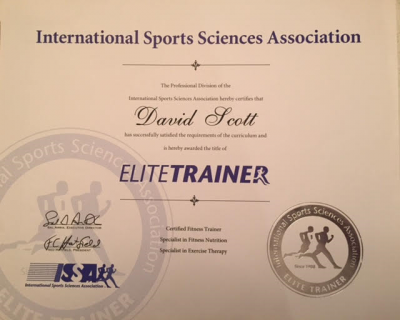 The ISSA is recognized as the world leader in fitness education and certification. As a graduate of their rigorous curriculum, I'm deeply trained in the art and science of how to improve your health. So if you want to live a stronger and more confident life, I've got the training and the expertise to help you every step of the way. 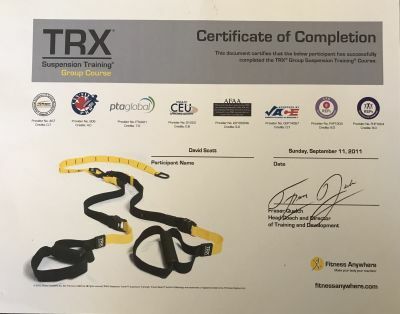 (TRX) Bodyweight training that helps build muscle, increase flexibility and strengthens the core. This equipment is convenient and takes up very little space. Easy to transport, and can be utilized in the gym, outdoors or in the comfort of your home. I added the link below. 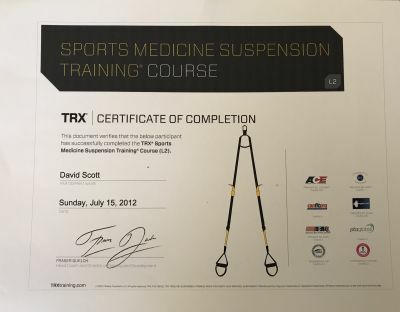 With the purchase of the TRX I will conduct a free one time 30 minute session for local residents. If you don’t reside in the SWFL area we will coordinate an online assessment. 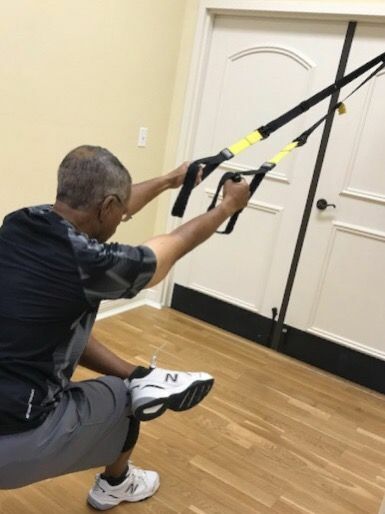 The TRX can safely and effectively assist with therapeutic and preventive exercise applications. 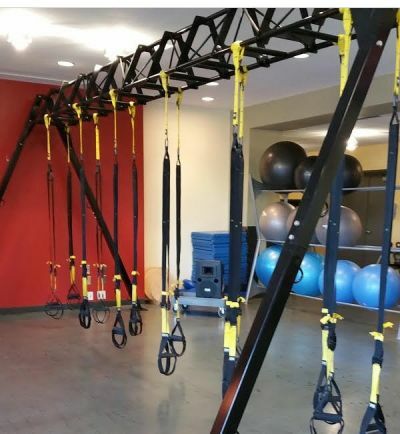 Great tool for musculoskeletal injuries, utilizing Suspension Training. Indoor cycling is a cardiovascular training that is performed indoors on a stationary bike. Indoor cycling can be aerobic and anaerobic in nature depending upon the program designed. 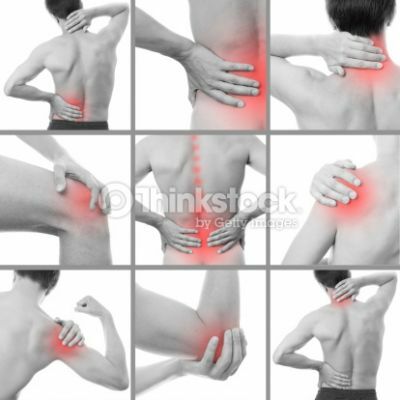 It's a great way to train aerobically without undue stress on the joints. Cycling improves cardiorespiratory fitness, core strength, speed, endurance and power. Cycling reduces resting heart rate and blood pressure through anaerobic training. Cycling is a great way to burn calories, increase heart rate and enjoy a fun filled hour of fitness. 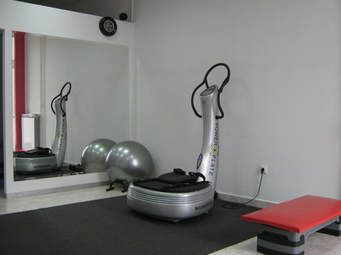 Power-Plate is a machine that gives the body's muscles a high-speed workout by using vibrations to stimulate them to contract and relax. They generally contract once or twice a second, but by standing on the Power-Plate, its vibrations cause an automatic reflex muscle contraction of 30-50 a second. Power-Plate is a great time-saver due to the effectiveness of training and the fact that many muscle groups are activated at the same time. It's claimed that 10 minutes on the Power-Plate will have the same results as 60 minutes of conventional strenuous training. 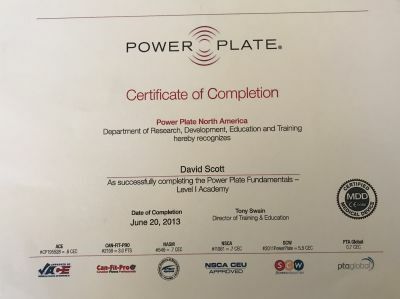 In addition to the basic certification necessary to get started in the fitness business, I decided to expand my knowledge in the health and wellness industry. This knowledge has given me the opportunity to work with clients in both nutrition and post-rehab training. Candidates who successfully complete all program components are awarded the distinguished title of ISSA Elite Trainer and hold CFT, SFN, SET and SSC training credentials. 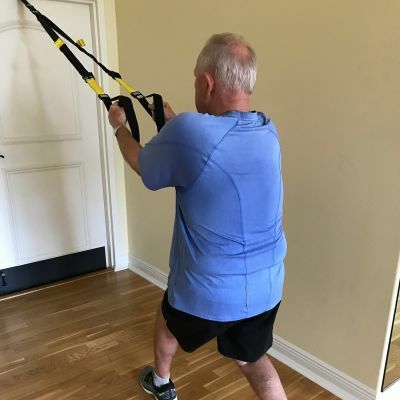 All too often, people suffering from debilitating medical conditions are inclined to think that fitness doesn't apply to them. In reality, fitness is even more vitally important to those who are recovering from medical care. 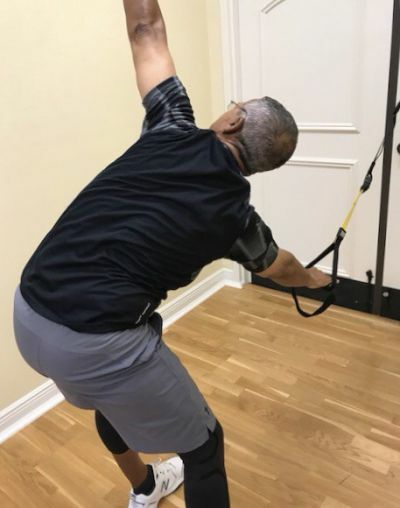 As a certified specialist in exercise therapy, I can help you design a fitness program that works around your condition, giving you a healthier and brighter future to look forward to. It's no secret - fitness training has been proven to prevent disease, strengthen your health and improve your confidence and outlook on life. As a certified fitness trainer, I'm deeply trained in everything from muscle mechanics to flexibility and cardiovascular dynamics. So if you want to live a stronger and more confident life, I've got the training and the expertise to help you every step of the way. Whether you want to gain muscle, lose fat, or live healthily, your limiting factor usually lies beyond exercise. Poor nutrition is what holds people back. As a certified specialist in this area, I can help you dispel the common myths about nutrition, and then work with you to design a "real world" nutrition plan that you can actually stick with and enjoy. I have great nutrition suggestions for individuals on the go or with strict time restraints. For my high sport performers / athletes: Level up your protein shake with Vega Sport Protein. Bone Broth: Alleviates joint pain and promotes healthy bones. In addition to leaky gut, drinking bone broth has been credited for signs of overall improvement in the immune system. When your body lacks the appropriate amount of collagen, your body’s connective tissue deteriorates and turns into cellulite. As your Nutrition Coach, Counselor, Consultant, Mentor and Motivator I can help progress you towards your personal wellness goals. 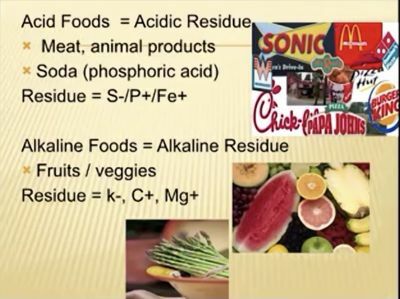 This will be executed through my broad knowledge of nutrition and how the body functions on a cellular level. Working as a team I will empower you to take responsibility for your health and wellness. Until recently, most people believed that power athletes are born and not made. That has changed. Modern training techniques can make anybody faster, stronger, and more powerful. Athletes at all levels - from grade school to the NFL - can sharpen their competitive edge with the help of an expert trainer. 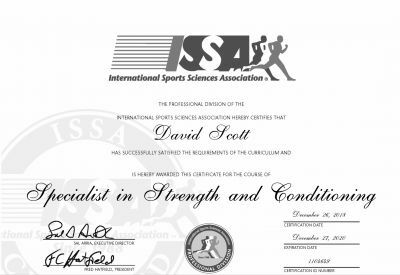 As a certified specialist in this area, I can help you expand your body's capacity for challenging athletic feats while remaining strong and free from injury.